Aveiro is a city and a municipality in Portugal. In 2011, the population was 78,450, in an area of 197.58 square kilometres (76.29 sq mi): it is the second most populous city in the Centro Region of Portugal. Along with the neighbouring city of Ílhavo, Aveiro is part of an urban agglomeration that includes 120,000 inhabitants, making it one of the most important populated regions by density in the Centro Region, and primary centre of the Intermunicipal Community of Aveiro and Baixo Vouga. Administratively, the president of the municipal government is José Ribau Esteves, elected by coalition between the Social Democratic Party and the Democratic Social Centre, who governs the ten civil parishes. Mindelo is a port city in the northern part of the island of São Vicente in Cape Verde. Mindelo is also the seat of the parish of Nossa Senhora da Luz, and the municipality of São Vicente. The city is home to 93% of the entire island's population. Mindelo is known for its colourful and animated carnival celebrations, with roots in Portuguese traditions. Figueira da Foz, also known as Figueira for short, is a city and a municipality in the Coimbra District, in Portugal. Practically at the midpoint of the Iberian Peninsula's Atlantic coast, it is located at the mouth of the Mondego River, 40 km west of Coimbra, and sheltered by hills. The population in 2011 was 62,125, in an area of 379.05 km². The city of Figueira da Foz proper has a population of 46,600. It is the second largest city in the district of Coimbra. The Coimbra Academic Association is the students' union of the University of Coimbra (UC). 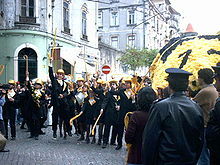 Founded in Coimbra on November 3, 1887, it is the oldest students' union in Portugal. It is also the biggest Portuguese students' union belonging to an independent institution, since it represents all the students of its university, who gain automatic membership into the AAC as students of the University of Coimbra. Lousã is a municipality in the district of Coimbra, in the central part of Portugal. The population in 2011 was 17,604, in an area of 138.40 km2. Miranda do Corvo is a town and a municipality in the Portuguese district of Coimbra, with an area of 126.38 square kilometres (48.80 sq mi) and 2011 population of 13,098 inhabitants. São João de Areias is a Portuguese civil parish in the municipality (concelho) of Santa Comba Dão, in the former-district of Viseu. The population in 2011 was 1,939, in an area of 21.51 km². The Coimbra University Stadium, or EUC, is an extensive sports complex of the University of Coimbra on Mondego's left bank, in Santa Clara parish, in the city of Coimbra, Portugal. The stadium was opened in 1963. The Portugal dos Pequenitos is a Miniature park in the civil parish of Santa Clara e Castelo Viegas, in the municipality of Coimbra, in the Portuguese district of Coimbra. The park consists of diminutive versions of Portuguese houses and monuments, and has pavilions dedicated to the former Portuguese colonies. 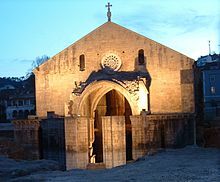 Santa Clara is a former civil parish in the municipality of Coimbra, Portugal. In 2013, the parish merged into the new parish Santa Clara e Castelo Viegas. It has a population of 9637 (2001) and an area of 9.77 km². 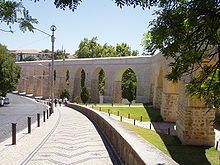 It is an urban parish, in the city Coimbra, and on the south of the Mondego river. Santo António dos Olivais, commonly shortened to Olivais, is an urban civil parish in the municipality of Coimbra in Portugal, making up the eastern part of the historic city of Coimbra, east of University Hill. The population in 2011 was 38,936, in an area of 19.27 km². 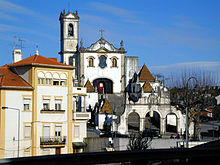 It is the most populated parish in the Municipality of Coimbra, and among the most densely inhabited in the country outside of Lisbon and Porto metropolitan areas. Created in 1836, the parish was named for Anthony of Padua, who joined the local branch of the Order of Friars Minor; Anthony took his name from Saint Anthony the Great, to whom the local Franciscan hermitage was dedicated. Sangalhos is a town and a civil parish in the municipality of Anadia, Portugal. The population in 2011 was 4,068, in an area of 16.90 km². 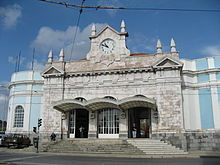 Santa Cruz is a former civil parish in the municipality of Coimbra, Portugal. In 2013, the parish merged into the new parish Coimbra. In 2001, its population was 6866 inhabitants, in an area of 5.56 km² that parallels the north (right) margin of the Mondego River, extending to the village of Adémia in Trouxemil. Coimbra is a civil parish in the municipality of Coimbra, Portugal. It was formed in 2013 by the merger of the former parishes Sé Nova, Santa Cruz, Almedina and São Bartolomeu. The population in 2011 was 13,971, in an area of 8.33 km². It covers the city centre of Coimbra.